Many people in my age range (50’s) don’t understand the merits of Twitter and Instagram. I, on the other hand, am obsessed. I turn to Twitter to stay informed of local and national news, to connect with DC’s food community, and to follow the 140-character musings of some of my favorite celebrities. Instagram, the photo-sharing site, is a bit voyeuristic. I check it periodically (or maybe more) mostly to see where the people I follow are dining, and to gawk over the beauty of their photographed food. My “feed” has been known to induce severe cravings. 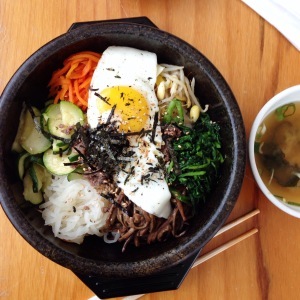 My Instagram photo of bibimbap at Korean restaurant Moa in Rockville recently led to food-envy from fellow bloggers Jennifer of Savory Simple and Linah of Linah’s List. The comments section of my photo becomes a forum for us to make plans to return there together for lunch. The decor at Moa is simple. There are clunky wooden tables and bench seats. Post-it notes line the walls. Moa isn’t about the atmosphere or the service, which can be aloof. The allure here is compelling Korean cuisine. 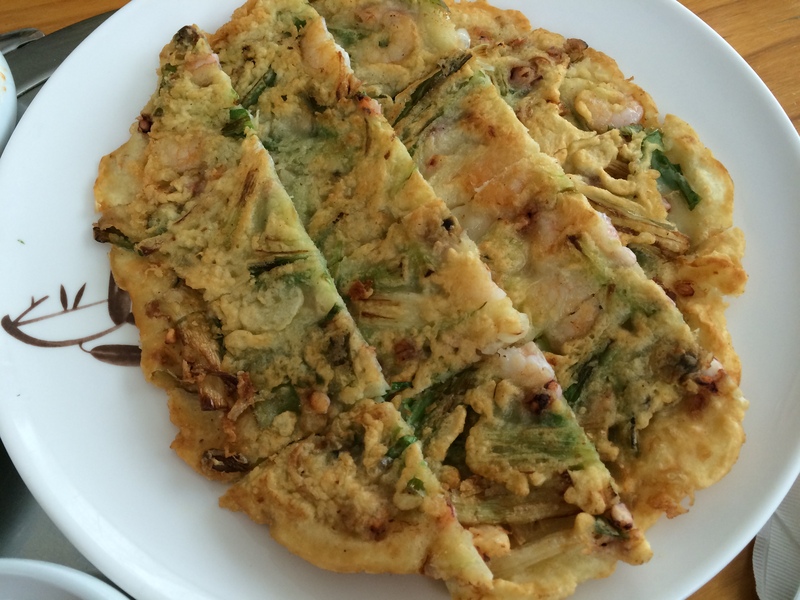 I’ve had the seafood pancake on three out of my four visits to the restaurant. A Moa meal now feels incomplete without it. The giant-sized pancake is thin and crispy, filled with shrimp and squid, and accompanied by a sweet and slightly spicy dipping sauce. This dish alone merits a visit to Moa. One of the most popular dishes is Dol Sot Bibimbap. Served in a stone bowl, it’s an irresistible piping-hot blend of marinated beef short ribs, spinach, carrots, zucchini, and bean sprouts. A fried egg tops the dish. It’s pure delight to swirl the ingredients together with chopsticks, and then dig in to retrieve some of the crunchy rice that forms at the bottom of the bowl. 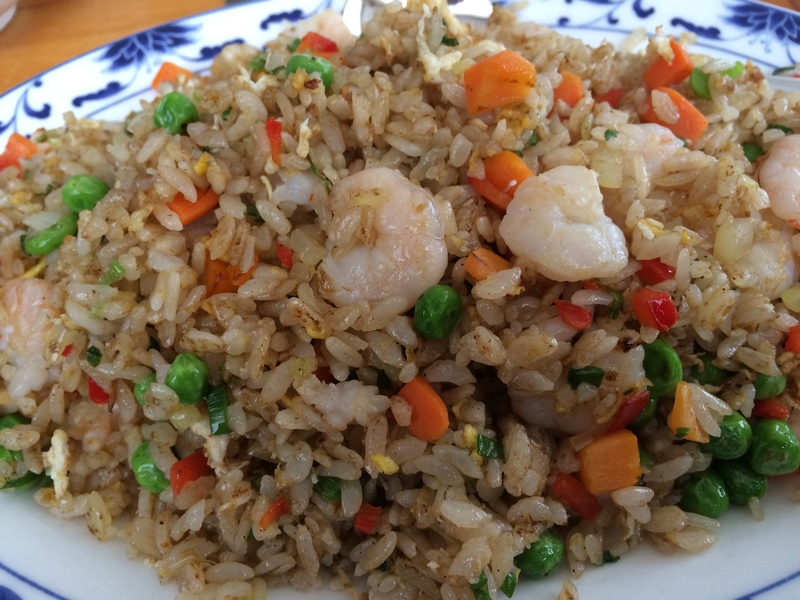 My latest visit includes an order of Shrimp Bokkeumbap, which is a basic fried rice with shrimp, peas and carrots, and egg. It’s a perfect dish for an unadventurous eater, which means it’s a little bland for my taste. It benefits from a dousing of the gochujang spicy sauce that accompanies the bibimbap. Moa sits on a quiet street in an industrial neighborhood in Rockville. The remote location makes it easy to forget, but it’s much better to remember. If it takes a tweet, a Facebook mention, an Instagram photo, or even a blog post to get you there…so be it. It’s just another great example of the benefits of social media. *Moa rocks with its Facebook page, Post a check-in, and benefit from a discount on your meal.